Word is they’re all hitting it well in the nets. Confidence is rising. Big scores are due. With players of their class, hundreds are just around the corner. As soon as one batsman cashes in, the floodgates will open. Because that’s the way it works. All batsmen have got a set number of runs at their disposal. If they haven’t used them, it means that they’re saving them up. Then, when the time comes, they’ve got hundreds and hundreds of runs tucked away and they’ll use them all in one go. A veritable flood of runs lies waiting behind the dam of repeated early dismissals and it’s just waiting to be unleashed. If England’s top six make ‘big runs’ on this flat pitch, under blue skies, against a bowling attack shorn of Shane Bond, Kyle Mills and Jacob Oram it’s PROOF that they were brilliant all along and the last dozen Test matches were just low-scoring aberrations. We can’t wait to have all our doubts washed away by the run flood. You think he felt bad? Imagine you’re Alan Mullally and you do the sums. Am relative newcomer to cricket (erm… since 2007) and have been mightily unimpressed with KP tho’ am assured by everyone he is a genius. 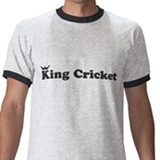 Pshaw is all I can say – I do believe the King has it right and he has used up his allowance of runs. KP out – Shah in – he must have a MOUNTAIN of runs to come. Ah but what if they don’t make runs against a pop gun attack? Will all those stored up runs follow them back to dear old blighty? Ceci, you must have had terribly bad luck if you’ve started following cricket at a time when KP isn’t being awesome every time he goes out to bat. He’ll be back to his best soon enough. A good prediction. A KP ton, useful runs from Broad but we’re still in the brown stuff. It would seem the runs are bound for blighty. At least as far as Vaughn, Strauss, and Bell are concerned. That means I’m sitting atop a volcano which could….anytime….Pure work of art King Cricket. I s’pose in the light of last night’s performance, maybe “big runs” meant each individual run was really something quite gargantuan, and wore our top order batsmen out so comprehensively that they didn’t feel they could manage more than two apiece. I feared this would jinx England, and it did. Hopefully Broad will unleash his fill of runs. I had big runs once. Your post has ACTUALLY MADE IT HAPPEN to Andrew Strauss.